Reversing an earlier ban, in 1962 voters in Long Beach, California, approved petroleum exploration in their harbor. Five oil companies formed a company called THUMS and built four artificial islands to produce the oil. Island Grissom, one of the four THUMS islands at Long Beach, California, was named after Nasa astronaut Col. Virgil “Gus” Grisson, who died in 1967 in the Apollo spacecraft fire. Photo courtesy U.S. Department of Energy. California’s Signal Hill was a residential area until a surprise oil boom in 1921 sprouted so many derricks it became known as “Porcupine Hill.” Much of the land was sold and subdivided in real estate lots of size described as “big enough to raise chickens.” Many homeowners became aspiring oil drillers and speculators. “Even today, those islands are viewed as one of the most innovative oilfield designs in the world,” notes Frank Komin, executive vice president for the California Resources Corporation. Circa 1965 illustration courtesy Oxy Petroleum. Derricks were so close to one cemetery that graves “generated royalty checks to next-of-kin when oil was drawn from beneath family plots,” noted one historian. By 1923, oil production reached more than one-quarter million barrels of oil per day. At the time, a “law of capture” for petroleum production ensured the formerly scenic landscape would be transformed. Competitors crowded around any new well that came in, chasing any sign of oil to the Pacific Ocean. Naturally produced California oil seeps led to many discoveries south of the 1892 Los Angeles City field. By the early 1930s, the massive Wilmington oilfield extended through Long Beach as reservoir management concerns remained in the future. Petroleum reserves brought drilling booms to southern California. By 1923, oil production reached more than one-quarter million barrels of oil per day from Signal Hill, seen in the distance in this detail from a panorama from the Library of Congress. Onshore and offshore tax revenues generated by production of more than one billion barrels of oil and one trillion cubic feet of natural gas helped underwrite much of the Los Angeles area’s economic growth. But not without consequences. After decades of prospering from petroleum production, the city prohibited “offshore area” drilling to slow the subsidence as the community looked for a solution. 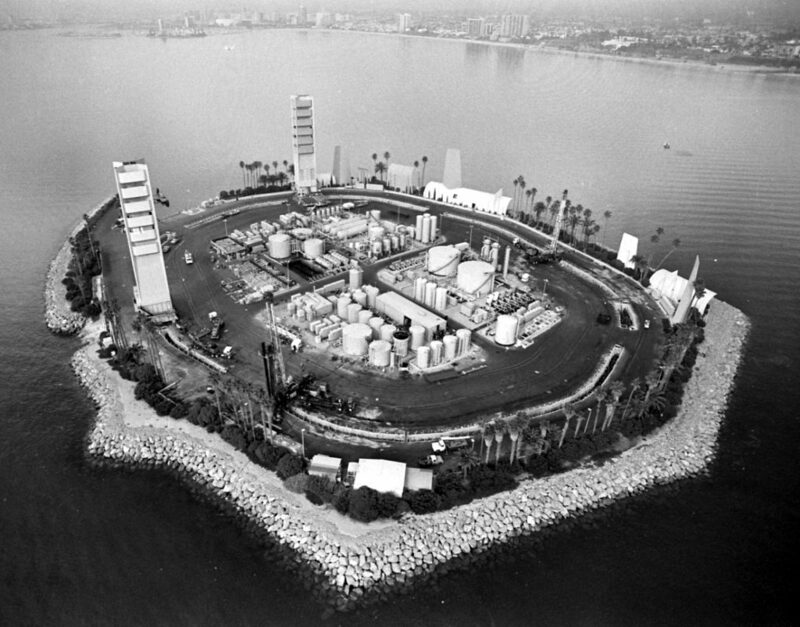 On February 27, 1962, Long Beach voters approved “controlled exploration and exploitation of the oil and gas reserves” underlying their harbor. The city’s charter had prohibited such drilling since a 1956 referendum, but advances in oilfield technologies enabled Long Beach to stay afloat. The prospering but “sinking city” of Long Beach would solve its subsidence problem with four islands and advanced drilling and production technologies. Photo by Roger Coar, 1959, courtesy Long Beach Historical Society. Directional drilling and water injection opened another 6,500 acres of the Wilmington field — and saved the sinking city. Five oil companies formed a Long Beach company called THUMS: Texaco (now Chevron), Humble (now ExxonMobil), Union Oil (now Chevron), Mobil (now ExxonMobil) and Shell Oil Company. They built four artificial islands at a cost of $22 million (in 1965 dollars). The islands in 1967 were named Grissom, White, Chaffee, and Freemen in honor of lost Nasa astronauts. Today the four islands, a total of 42 acres, include about 1,000 active wells producing 46,000 barrels of oil and 9 million cubic feet of natural gas every day. Meanwhile, all of this happens amidst the scenic boating and tourist waters in Long Beach Harbor. The California Resources Corporation operates the offshore part on the islands of the Wilmington field, the fourth-largest U.S. oilfield, according to the Los Angeles Association of Professional Landmen, whose members toured the facilities in November 2017. “Most interestingly, the islands were designed to blend in with the surrounding coastal environment,” explains LAAPL Education Chair Blake W.E. Barton of Signal Hill Petroleum. “The drilling rigs and other above-ground equipment are camouflaged and sound-proofed with faux skyscraper skins and waterfalls.” Most people do not realize the islands are petroleum production facilities. From the nearby shore, the man-made islands appear to be occupied by upscale condos and lush vegetation. Much of the design came courtesy of Joseph Linesch, a pioneering designer who helped design landscaping at Disneyland. “It was an exceptional design. The people who were involved at the time were very creative visionaries,” notes Frank Komin, executive vice president for southern operations of the California Resources Corporation, the latest owner of the islands. THUMS Island White, named for Col. Edward White II, the first American to walk in space, who died in 1967 along with Nasa astronauts “Gus” Grissom and Roger B. Chaffee. A fourth island was named for Nasa test pilot Ted Freeman, who in 1963 was the first fatality among the Nasa astronauts. Photo courtesy UCLA Library. The Journal article, “THUMS Oil Islands: Half A Century Later, Still Unique, Still Iconic,” explains that 640,000 tons of boulders, some as large as five tons, were mined and placed to build up the perimeters of the islands.